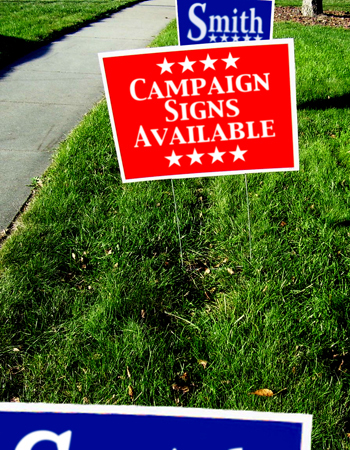 In addition to being a practical and effective way to promote your brand or message, coroplast yard signs have a lot of curb appeal. Designed to maximize your budget, corrugated plastic yard signs can be printed in full color for a fraction of the cost of other options. Majestic Printing Systems can print 4x8 coroplast sheets as well as other standard sizes like 24x18, 24x24, 24x36. Looking for something similar to a yard sign that you can take with you on the go? Visit our vinyl banners page. We can create custom vinyl banners for every kind of special occasion.